As part of our marketing and technological surveillance, we are now interested in a mobile application launched by Immoweb, Belgium’s leading platform on the real estate market. This application, called Homestamp, has the particularity of using blockchain technology. The purpose (to validate the inventories online thanks in particular to photos and videos with certified timestamps) seemed to us to be particularly relevant to others who use the blockchain without providing any additional added value. Good examples of the use of the blockchain being rare, we met Laurent Dupont, in charge of innovation at Immoweb, to learn more about Homestamp. Immoweb, the leading real estate platform in Belgium, was acquired by the German company Axel Springer in 2012. Synergies are therefore being created between the two entities, one of which is the mobile application Homestamp. Homestamp, based on blockchain technology, is a first full-scale test for Axel Springer and Immoweb. The test was initiated by Axel Springer’s QED.digital department which is specialized in blockchain technology. It became clear that the blockchain was of interest in markets where certification by an external authority (notarization) would provide added value for the user. This is how the idea of Homestamp, based on time stamping, emerged. 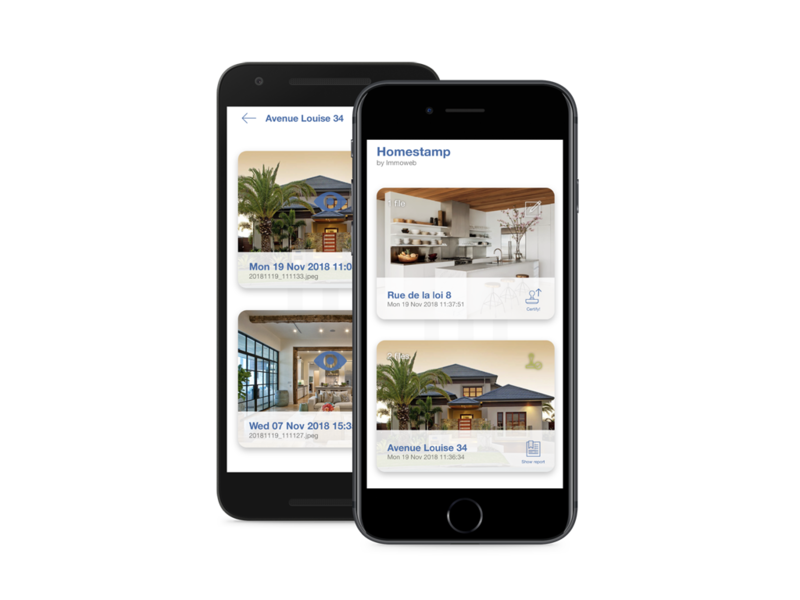 Homestamp is a mobile application that allows you to carry out an inventory of fixtures using multimedia files such as videos and photos. Homestamp allows certifying at a particular time the validity of the inventory. Moreover, this is particularly relevant in that 85% of the inventories between private individuals in Belgium are carried out by mutual agreement, without the assistance of an expert, which in many cases leads to disputes. Homestamp, using its own process, allows the “certification” of this inventory of fixtures. However, it may also be useful to experts who provide advice associated with the expertise in the final report as an additional value. The first goal is, therefore, in the event of a conflict between individuals who have not used an expert, to avoid disputes about the validity of the multimedia files. 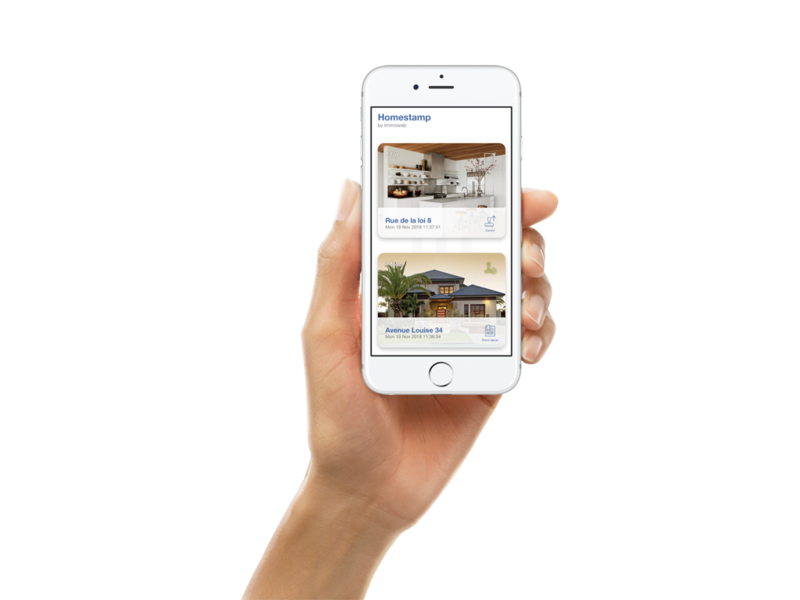 Homestamp is now available as a mobile application under IOS and Android. At this stage of the MVP (Minimum Viable Product), co-developed by Axel Springer and Immoweb, 500 downloads have already been made, most of them out of curiosity by users wishing to see how it works. The testing of this product is only done in Belgium that is generally recognised as a good test market. As part of the launch of this MVP, Immoweb’s stated objective is to increase its knowledge of customer needs and improve the product by co-constructing it with its users. Some of them had already been involved in focus groups when the product was being designed. At this stage of development, user feedback is sought proactively by sending an email to all people who have downloaded the app and given their consent to contribute to the development of Homestamp. This is undoubtedly an excellent way to conduct market research. The Berlin-based QED.digital department with a team of blockchain experts launched this initiative in March-April 2018. The decision to launch Homestamp was made rapidly. A POC (proof of concept) was produced internally in April-May 2018 and then used to improve the application by pushing its limits to identify essential points that needed to be developed through focus groups in which participants were invited to test the application and give their feedback. Experts were also called upon to provide input. The evolution from POC to MVP then took place at the beginning of October 2018 by incorporating the improvements suggested by focus groups and expert interviews. In France, WeProov is active in the same field and Laurent Dupont, far from being intimidated by the competition, sees this as proof that there is a need on the market. According to Laurent Dupont, there is no differentiation with WeProov. However, as in any technology project, it is execution, the speed of delivery and go-to-market that make the difference. And that is where Immoweb, aware of the need for continuous innovation in this market, intends to do well. In related fields, other applications are also available on the market. For example, RXeal.com offers a rental deposit in the blockchain and Rentberry.com provides a complete online service around rentals. The next step is to link Homestamp with Immoweb.Docs, a kind of secure safe for everything related to rentals. The Homestamp application itself will evolve. In 2019, the user will have the possibility to add additional information in text form to complete the inventory of fixtures. Suggestions such as taking pictures of gas, electricity and OCR meters with a link to a new supplier should also be provided to avoid possible disputes.